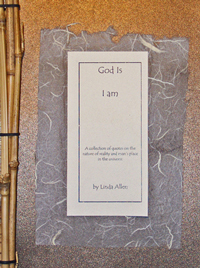 Linda Allen published God Is I Am: A collection of quotes on the nature of reality and man's place in the universe (2004). The booklet is a compilation of quotes, poems, and 'bits of wisdom' Allen has collected over her lifetime. It will provide inspiration for readers who are on their own spiritual quest. A beautifully hand-bound copy of God Is I Am is available in the Bainbridge Public Library's local author collection.